Color: Unfed adults are mahogany to rusty brown; engorged bed bug is red-brown after a blood meal. Nymphs (baby bed bugs) are nearly colorless when they first hatch and become brownish as they mature. Shape: Unfed bed bugs are flat; broad oval; fed bed bugs become swollen and more elongated. Size: Adult bed bugs are about 1/4 inch long. Nymphs (baby bed bugs) range from 1.3 mm to 4-5 mm. The common bed bug (Cimex lectularius Linnaeus 1758) is an ectoparisite insect (a parasite which lives on the outside of the body of the host) of the family Cimicidae. 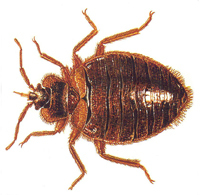 Bed bugs feed only on the blood of humans and other warm-blooded hosts. Although they have a cryptic behavior and can conceal themselves in tight cracks and crevices, bed bugs are often found in bed parts, such as mattresses and box springs, hence the common name. These pesky insects are extremely resilient to any household product. Bed bugs like to travel and are good hitchhikers. They will hide in suitcases, boxes and shoes to be near a food supply. They are elusive, nocturnal creatures. They can hide behind baseboards and in cracks, crevices, and folded areas of beds, bedding and adjacent furniture, especially mattresses and box springs. Bed bugs can also hide in electrical switchplates, picture frames, wallpaper and nearly anywhere inside a home, car, bus, or other shelter. Bed bugs usually come out at night for a blood meal. However, they are opportunistic insects and can take a blood meal during the day, especially in heavily-infested areas. Bed bugs usually require 5-10 minutes to engorge with blood. After feeding, they move to secluded places and hide for 5-10 days. During this time, they do not feed but instead digest their meal, mate, and lay eggs. Bed Bugs like to hide in small cracks and crevices close to a human environment. They can be found behind baseboards, wallpaper, upholstery, and in furniture crevices. Beg bugs are also known to survive in temporary or alternative habitats, such as backpacks and under the seats in cars, busses and trains. Never bring second-hand furniture, especially mattresses and box springs, into a home without thoroughly examining for signs of a bed bug infestation. You might consider having a pest control professional inspect the furniture as it is difficult to detect an infestation if you are untrained. Bed bugs are elusive creatures, so it is imperative to seek professional pest control to address an infestation.